Laurel and Hardy, Riggs and Murtaugh, Butch Cassidy and Sundance and now The Nice Guys! The key to the success of a movie pairing is chemistry. Putting two mismatched people together isn’t what makes a movie funny or interesting, it is how well the two spark off each other and from the moment that Russell Crowe’s Jackson Healy meets (and the breaks the arm of) Ryan Gosling’s Holland March, you realise that this film will work and that a new, effective pairing have been created. This is down to two key ingredients. The first is the writing. Writer and director Shane Black is excellent at creating character you want to watch on-screen. He is more than a little responsible for the Lethal Weapon pairing and manages to capture that magic again here. The dialogue is quick, clever and funny. He creates a hard-man who wants to better himself next to a broken private detective who is more effective than he realises. They compliment each other, work together begrudgingly and stumble through the twisty, noir plot that brought them together. All the greatest writing in the world would not be any good if it wasn’t for the two actors delivering the performance. Russell Crowe plays a past-his-prime, overweight but effective hard-man, who solves problems for people, usually by beating them-up. He does it with charm rather than intensity and although he is using violence, you can’t help but root for him, particularly when dealing with a henchman who is killing his fish. It is Gosling that manages to steal the film. He enters the movie sat in the bath, fully-clothed, and then continue to dazzle with great comedy timing and delivery. He does slapstick well, plays a drunk buffoon well and shines brightest when he is clearly out of depth. The best compliment you can give the pairs performance is that you want to see more of them and if a Nice Guys 2 was announced, it wouldn’t be a negative thing. They are also carrying the movie forward when the plot fails to do so. The film is never boring but there are times when it feels that the plot is thinly holding itself together, especially when moments have already been telegraphed or set-pieces feel like they are repeating themselves. A good detective story is hard to write anyway, relying at times on coincidence and convenience than actual detective work and occasionally that happens here but Shane Black has put in enough twists, surprising plot developments and genuinely clever moments to elevate the film. It helps that Shane Black has also set the movie in the 70s. This adds to the way the film works, with the characters feeling like classics from a different era than just another action-comedy pairing. The cars, music and fashion help sell this development and it offers something different to a well-worn movie trope. The real selling point becomes the humour though. Shane Black knows how to write witty, sharp dialogue and also find the best situations to put two hapless private detective in, with Gosling relishing these opportunities more than anyone else. 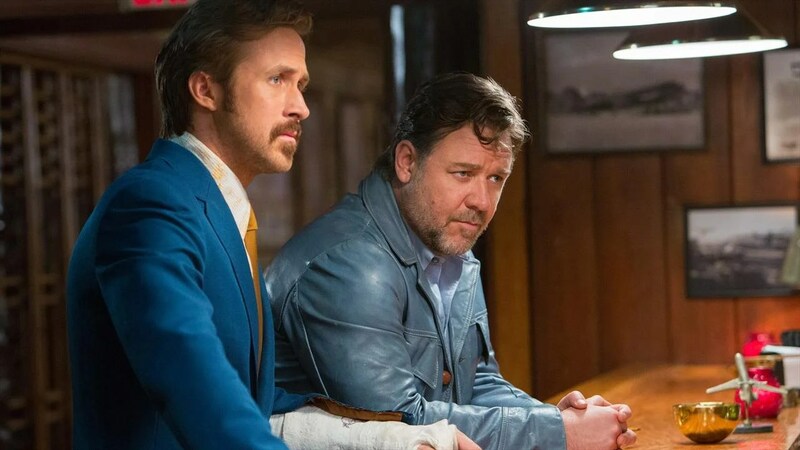 Overall, The Nice Guys has created a new Hollywood double-team I would gladly watch again. Russell Crowe and Ryan Gosling spark on-screen and have created a central act which could carry a franchise. If Shane Black can continue to give them quick wit, clever situations and a half-decent case to investigate then the issues with some plot pacing and predictable storyline can be overlooked. I really enjoyed this film. Crowe and Gosling were a great pairing, and I agree that the plot was relatively weak, although not because of predictability. To me, it mostly just felt like a coincidence that these two were following a mystery. They never really did any solving, they just sort of happened to stumble upon the next step time after time, and while that made for some funny moments, I never felt interested in trying to beat them to any of the answers. Luckily the chemistry between the two leads was phenomenal and carried the movie. While I was watching it I wasn’t particularly bothered by the fact that I didn’t care about the mystery. I was just enjoying two bumbling fools wander through LA in the 70s.